Henry, Joe, and Claire live in a very sad family. Sometimes, their dad gets very angry and hits their mom. This doesn't happen all the time, though-sometimes, Dad is nice and fun. Henry, Joe, and Claire wish these fun times would never end. They must learn to understand that the fights are not their fault, and they must learn to talk to an adult about the feelings they are having. 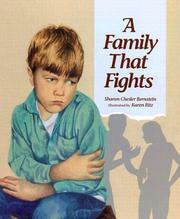 Berstein, Sharon Chesler, “A family that fights,” Children's Picture Book Database at Miami University, accessed April 25, 2019, https://dlp.lib.miamioh.edu/picturebook/items/show/8545.